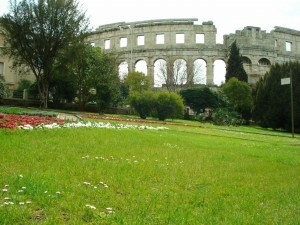 If you are looking to stay close to the centre of Pula, the hotel to pick is the Guest house Hotel Riviera** , it is situated almost within viewing distance of the Roman amphitheater, the Arena and just a few meters form the Sea and also close to the largest city park. The building of the Hotel is a neo-Baroque building from the end of 19th century, it was build when the Austria Hungarian Empire was ruling in Pula, and the hotel was as that point of time the elite accommodation of the city. Today the hotel act also at a meeting place for many famous celebrities visiting the Pula Film Festival and the Histria music festival. The Guest house Hotel Riviera has 67 comfortable rooms on 5 floors with panoramic views of the historic centre and the waterfront. Facilities in the public hotel areas include a reception, a spacious café bar with a outside terrace from where there is an excellent view, each of the 5 floors has a lobby area. A bar is of course also available as wells as typical hotel services, like Internet services, Fax/Photocopying. The Wireless Internet Hotspot is available in all public areas and is free of charge. In the surrounding of the hotel there is services like exchange office, rent a car and tourist agencies offering excursions. The hotel has its own A la carte restaurant, and there are plenty of local restaurants within walking distance from the Hotel. Hotel Riviera also has congress facilities for up to 50 people, which also can be used for receptions and company seminars etc. This hotel can be recommend for guest who would like to spend the evenings in Pula city centre enjoying the cultural offer of the city, the ambient in the unique historical building is a perfect spot for a relaxing city break.